The Captain Resin Mod is the latest addition to the iJoy's CAPTAIN series. The Captain Resin features a more compact streamlined design highlighted by exquisite resin materials. Adopting TEMP, POWER and TCR modes for your selection. Utilizing dual 20700 batteries with the power to fire up to 200W. The Captain Resin Mod also offers a compact chassis that can accommodate atomizers up to 28mm without overhang. Featuring a 0.96-inch intuitive display for easy user interface. EXTRAORDINARY DESIGN - A wild e-cig with an ideal sense of balance. From its proportions to its exquisite resin materials, every element reveals its purpose, and its passion. LASTS LONGER, REACTS FASTER - A Captain Resin only starts with the state of the art. Compatible with dual 20700 batteries. From there, everything from chip-set to coil head is developed to quicken, heighten and intensify its response. The Captain Resin Tank is a thoroughly upgraded new tank with the application of crafted resin materials. 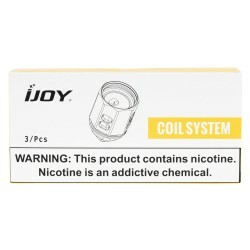 Featuring optional 6ml / 4.5ml / 2ml e-juice capacity and 28mm diameter. Together with the all-new 0.2 ohm MESH 1 and MESH 2 coils and dual adjustable bottom airflow slots for bringing you the best vaping flavor. PICK YOUR FAVORITE COLOR - Treat your Captain Resin like a personal style signature, by choosing the color that best represents yourself. OPTIONAL MODES. OPTIMAL MOODS - Featuring POWER, TEMP, TCR modes for your selection, meet your different vaping demands.